As with any real-life couple, Dingdong Dantes and Marian Rivera have different preferences. Take it from their latest McDonald’s fun and playful TV commercial which you can watch HERE. 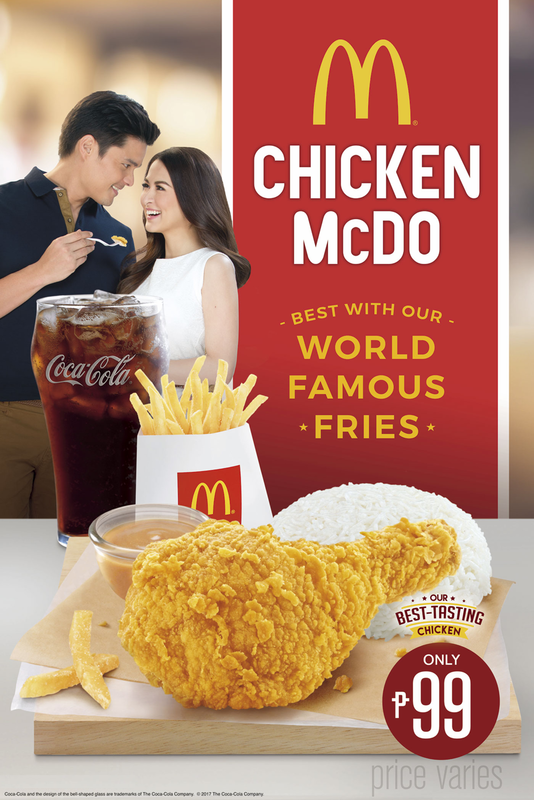 With their differences set aside, DongYan agrees on one thing and that is to enjoy McDonald’s Best-Tasting Chicken McDo with the World Famous Fries. Like DongYan, give in to the savory Chicken McDo—marinated, breaded, and cooked to a golden perfection where every piece is juicy and crunchy all at once and the World Famous Fries made with premium potatoes that are crisp on the outside and fluffy on the inside. It’s definitely the best pair anyone will agree to! Invite your friends and loved ones to try Chicken McDo with World Famous Fries and regular drink for only Php99 at any McDonald’s restaurant nationwide. Share your photos on Facebook, facebook.com/McDo.ph or tag @McDo_PH on Twitter or Instagram.